Cab tilted, but the review model could not hold this pose. Hose reel can let out hose. 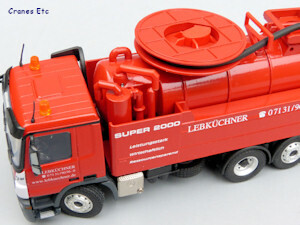 This drain cleaning vehicle is a Super 2000 made by Wiedermann & Reichhardt of Germany. 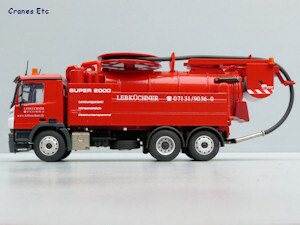 It is mounted on a Mercedes-Benz Actros 6x2 chassis. 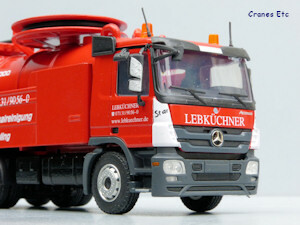 This version of the model is in the colours of Lebküchner, a German contractor based near Heilbronn. It is based on the vehicle in the fleet called 'Star'. 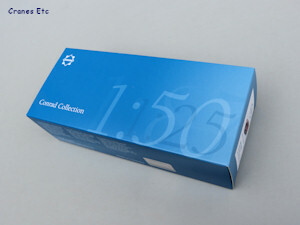 The model comes in a Conrad branded box and inside it is wrapped in foam rubber. 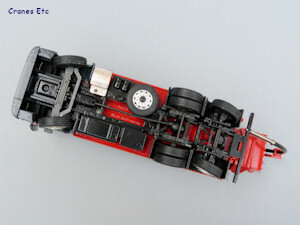 Looking underneath the transmission is fully modelled although the drive shaft clashes with the spare wheel a little. 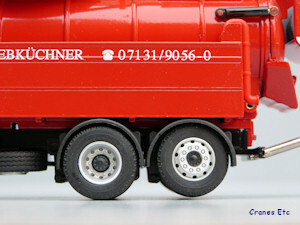 The rear axle suspensions are modelled in plastic with the front axle modelled for functionality. The wheels look good. The Actros cab is captured well with the lights having lenses and there are textured two-tone door mirrors. The door handles are plastic inserts and the steps have some textured surface. The graphics are good and the 'Star' name is printed although surprisingly the number plate is not replicated. The sides of the body have some panel detail and the graphics are very sharp. Inside the body the large tank is metal and the pipes are a mix of metal and plastic with a good colour match. 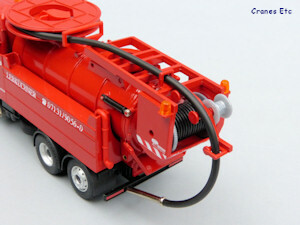 The big hose spool on top is metal and the hose is good quality plastic. The ram which raises the tank is plastic and does not look so good. 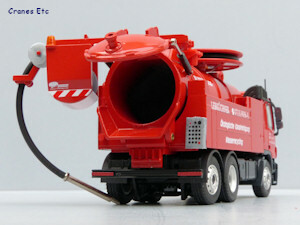 At the rear the hose gantry is metal and the small hose reel would have looked better with some hose on it. A control console is mounted at the back and the rear lights are painted. The rear axle also steers and achieves a good angle. It can also be raised out of service. 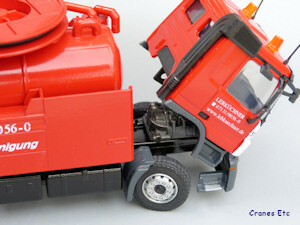 The cab tilts but tends not to maintain a full tilted angle. 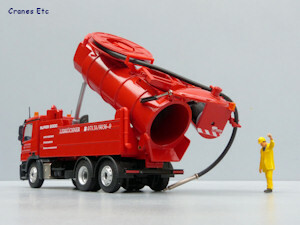 The big hose reel rotates and can spool out suction hose. The rear gantry rotates on either side. The tank can be tilted although the plastic ram is soft so care has to be taken when lowering the tank not to push the ram out of line. 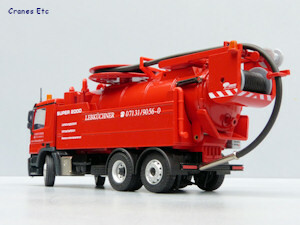 The rear door of the tank can be opened. 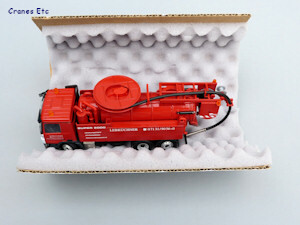 As usual the metal content is high so this is a strong model. 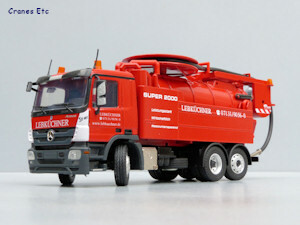 It is interesting to see a truck model from a less common sector and Conrad has produced a good looking functional model. 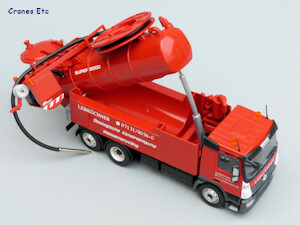 This version of the model first appeared at the Nuremberg Toy Fair in 2014. Rear axle raised out of surface. Plastic ram is not so good.